Stories connect us. They connect us to each other, to our roots, to our God. Stories help us learn from our past—to repeat the good and avoid the mistakes. Jesus used stories to communicate concepts with his listeners, and preachers do the same today. Individuals like the Church of God historian (Gary Agee) and our archivist (Nicholas Stanton-Roark), as well as groups like the Historical Society, strive to preserve, tell, and retell stories, too. Their stories take place within the context of the Church of God movement, and all point to the love of an eternal Father whose provision is not bound by time and space. 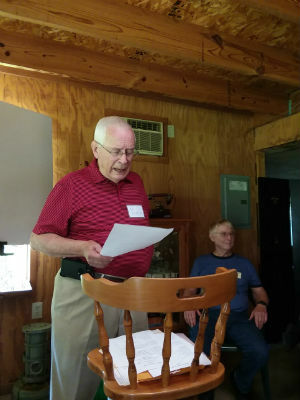 At a late-June gathering of the Church of God Historical Society in Anderson, Indiana, Nyle Kardatzke was invited as a guest speaker to highlight some of the common experiences of “growing up Church of God”—both serious and whimsical—as well as the unique story of one Ohio church that came to life in the wake of death. George Gleckler was out for a joyride with his family near Fremont, Ohio, one beautiful day in 1913. Sadly, the beautiful turned into sorrowful when a collision with a train claimed the lives of his wife and son. The sting of death was great and lasted for a season, but out of that tragedy, Elmore Church of God in George’s hometown was born. When death becomes more than an abstract reality, when it hits close to home, eternity suddenly comes into view, and certainly did for George Gleckler. 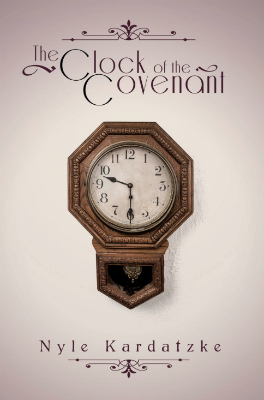 This story, as well as numerous other stories of God at work in the church, and often from the perspective of a young boy, is what Nyle Kardatzke’s book The Clock of the Covenant is all about. Nyle’s grandmother, alongside George Gleckler, was one of the pioneers of Elmore Church of God in Elmore, Ohio. Emma Kardatzke, neighbor and friend to the Gleckler family, was also one of the first to offer comfort and care to the survivors. She and her husband Fred would ultimately have nine children, several of whom had a profound and widespread impact on the Church of God. Elmer “Mit” Kardatzke not only pastored one of the largest Church of God congregations in Wichita, Kansas, that ultimately became Central Community, but also became well-known for leading the early-morning prayer meetings at Anderson Camp Meeting. Carl Kardatzke was an influential professor of education at Anderson College from 1933 until 1959. This collection of stories is not memoirs, however; these are the stories of nearly every kid who grew up in the Church of God in the early to mid-twentieth century: for example, those continuous Amens rumbling through the pews, footwashing, weddings, funerals, “church rules,” Sunday school picnics, Sunday school shenanigans, as well as the variety of joys and calamities that came with going to church in those days. Dale Stultz, Historical Society president, speaks at this year’s retreat. Nyle teaches senior adults today at Church at the Crossing in Indianapolis, but Elmore Church of God was his childhood church. He loves to go back on occasion, and he’s ever blessed to be a part of their precious heritage. In 2013 the church, which started out of tragedy, celebrated its centennial. The church might not have made it to their 100th birthday, however, if God hadn’t sparked new life in the congregation, which had dwindled to eighteen people on the Sunday Pastor Tom Willhardt arrived in 2001. Nyle’s thrilled by the leadership of Pastor Tom, as the congregation is more involved in the community than it ever has been, and ninety people now call Elmore Church of God home. 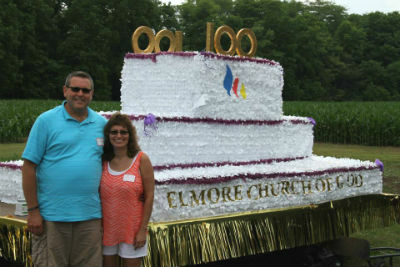 Pastor Tom and Pam Willhardt at the Elmore CHOG centennial in 2013. 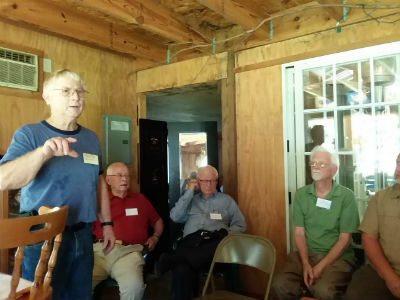 It was a warm weekend at the home of Dale Stultz, president of the Historical Society. Between heritage hymns, a hot dog roast, a Church of God book sale, and sweet fellowship, as well as Nyle Kardatzke’s presentation about one church’s unique story, the Historical Society retreat this year was a celebration of a God who is “just the same today.” Learn more about the Church of God Historical Society and their annual event by visiting www.choghistoricalsociety.org. You’ll also find them on Facebook and Instagram. Every church has a story, and Jesus is no doubt at the center of each one. What kind of story is God writing at your church? Would it inspire others? E-mail chognews@chog.org and help us tell your story, to God be the glory. To purchase of copy of Nyle’s book The Clock of the Covenant, visit https://www.amazon.com/Clock-Covenant-Nyle-Kardatzke/dp/1498482244/. To learn more about the Church of God movement, visit www.JesusIsTheSubject.org. This entry was posted in All Church of God, Great Lakes and tagged book, Church at the Crossing, Church of God Historical Society, Elmore, Elmore Church of God, Emma Kardatzke, George Gleckler, heritage, historical, history, life, Nyle Kardatzke, OH, Ohio, retreat, stories, Sunday school, The Clock of the Covenant, Tom Willhardt. Bookmark the permalink.